Go to original pattern for design DROPS 175-26. DROPS DOUBLE POINTED NEEDLES AND CIRCULAR NEEDLE (80 cm / 32'') SIZE 9 mm/US 13 – or size needed to get 10 stitches and 12 rows in stockinette stitch = width 10 cm / 4'' and 10 cm / 4'' vertically. Knit all rows. 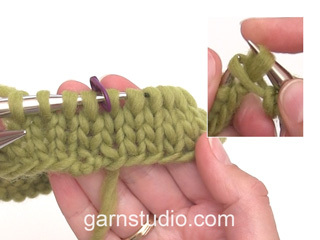 1 ridge = Knit 2 rows. Increase as follows before stitch with marker: Work until 1 stitch remains before stitch with marker, make a yarn over. Increase as follows after stitch with marker: Work 1 stitch, make a yarn over. On next round knit yarn overs twisted to avoid holes. Body is first worked in the round on circular needle, then divide the piece and finish front and back piece separately back and forth. 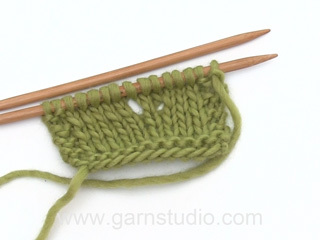 Sleeves are worked in the round on double pointed needles and sleeve cap is worked back and forth. Cast on 108-120-124-136-152-156 stitches on circular needle size 9 mm / US 13 with Melody. Purl 1 round. Insert 1 marker in first stitch, skip 53-59-61-67-75-77 stitches and insert 1 marker in next stitch. Work in stockinette stitch. REMEMBER THE GAUGE! When piece measures 29-30-31-32-33-34 cm / 11 3/8''-11¾''-12¼''-12½''-13''-13 3/8'', bind off 7-7-9-9-11-13 stitches in each side for armholes (i.e. stitch with marker and 3-3-4-4-5-6 stitches on each side of both markers). Work front and back piece back and forth separately. = 47-53-53-59-65-65 stitches. Work 2 rows in stockinette stitch. Work next row from right side as follows: Work 1 edge stitch in GARTER STITCH - see explanation above, work 3 stitches in garter stitch, * 3 stitches in stockinette stitch, 3 stitches in garter stitch *, repeat from *-* until 1 stitch remains on row, 1 edge stitch in garter stitch. Continue pattern like this. When piece measures 50-52-54-56-58-60 cm / 19 3/4''-20½''-21¼''-22''-22¾''-23 5/8'', bind off the middle 17-17-17-19-19-19 stitches for neck and finish each shoulder separately. Then bind off 1 stitch on next row from neck =14-17-17-19-22-22 stitches remain for shoulder. Bind off when piece measures 52-54-56-58-60-62 cm / 20½''-21¼''-22''-22¾''-23 5/8''-24 3/8''. = 47-53-53-59-65-65 stitches. Work 2 rows in stockinette stitch. Then work pattern as on back piece. When piece measures 44-46-48-48-50-52 cm / 17 1/4"-18"-19"-19"-19 3/4"-20½'', bind off the middle 11-11-11-13-13-13 stitches for neck and finish each shoulder separately. Then bind off on every row from neck as follows: 2 stitches 1 time and 1 stitch 2 times = 14-17-17-19-22-22 stitches remain for shoulder. Bind off when piece measures 52-54-56-58-60-62 cm / 20½''-21¼''-22''-22¾''-23 5/8''-24 3/8''. Cast on 21-22-23-24-25-26 stitches on double pointed needles size 9 mm / US 13. Purl 1 round from right side. Insert 1 marker in the first stitch on round. Then work in stockinette stitch. When sleeve measures 8 cm / 3 1/8'' in all sizes, increase 1 stitch on each side of marker - READ INCREASE TIP. Increase like this every 4th round 9-11-8-6-1-1 times in total and every 5th-0-3rd-3rd-3rd-3rd round 2-0-4-6-12-12 times in total = 43-44-47-48-51-52 stitches. 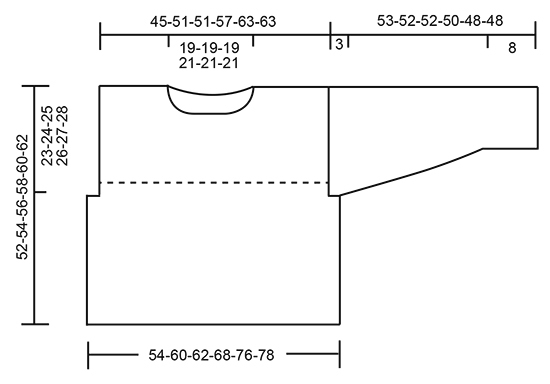 When piece measures 50-49-49-47-45-45 cm / 19 3/4"-19 1/4"-19 1/4"-18½"-17 3/4"-17 3/4" (shorter measurements in the larger sizes because of wider shoulders), bind off 7-7-9-9-11-13 stitches mid under sleeve (i.e. stitch with marker and 3-3-4-4-5-6 stitches on each side of stitch with marker). bind off 5 stitches 1 time and 4 stitches 1 time = 18-19-20-21-22-21 stitches. Bind off. Piece measures approx. 53-52-52-50-48-48 cm / 21"-20½"-20½"-19 3/4"-19"-19". Work another sleeve the same way. Sew shoulders together with grafting/kitchener stitches inside bind-off edge. 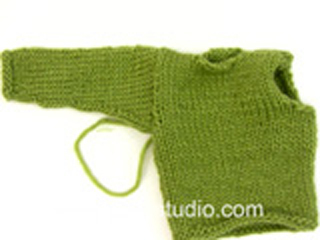 Then sew sleeves in body: Sew inside edge stitch in garter stitch on body and bind-off edge on sleeves. Fold the sleeve edges up 2 times and fasten with a small stitch in each side. Do you do anything to finish the neck edge? Dear Mrs Williams, there is no finishing edge on neck to this pattern. Happy knitting! Do you do any finishing to the neck edge? Do you do any finishing to the neck edge. It doesn"t look very finished! Dear Ms. Williams, no, there is no special finishing for the neck edge in this pattern. 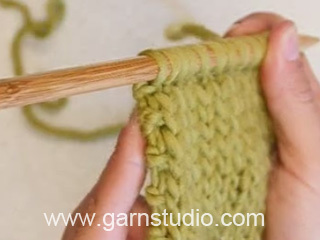 But of course you can use some of your favourite edging - knitted or crocheted. You only have to do it loose enough, so the garment stay flat. Happy knitting! Bonjour, je désirerais faire ce modèle pour ma nièce de 16 ans qui taille XS, pensez-vous qu'en diminuant la taille des aiguilles du 9 au 8 ou au 7 peut me permettre d'atteindre cette taille XS ?Merci de votre réponse. Cordialement. Bonjour Domi, nous ne sommes malheureusement pas en mesure de pouvoir ajuster chacun de nos modèles à chaque demande. Vous pouvez vous aider du schéma des mesures et ajuster en fonction de votre tension. Votre magasin saura vous assister si nécessaire - même par mail ou téléphone. Bon tricot! I am confused by the instructions to skip 53-59-61 etc stitches in the second row after casting on. Does this mean to slip them or to SKP? Dear Cherylin, after you have worked the first round purling all sts, you will now insert 2 markers (without working the sts): insert the 1st marker in the first st on the round, then count 53..77 sts (see size) and insert a marker in the next stitch (= 54th, ... 78th stitch - see size). You will not work the stitches on this round, just count them and insert the markers. Happy knitting! Hei! Kiitos viestistä, malli neulotaan tietysti alhaalta ylös. Otsikko on korjattu. Bonjour Anne-Sophie, tout à fait, sur l'endroit, vous tricoterez en mailles endroit, mais sur l'envers, il vous faudra alterner mailles envers et mailles endroit pour que, vu sur l'endroit, vous ayez bien: 3 m point mousse, *3 m jersey, 3 m point mousse*. Bon tricot! Hur gör om man inte vill använda rundstickor.? Kanske för att gör sprund vid sidorna. Hi! My question is: was it a designer's idea to tuck in sleeves? Or it happened by chance? I gonna knit this jumper and already ordered yarn. So I would like to know what should come out finally. Thank you. Dear Lada, the bottom of sleeve will be folded when piece is done. You can check the measurements for your size in chart so that you will be sure that the sleeve will be long enough to fold the bottom. Happy knitting! Hei Lise. 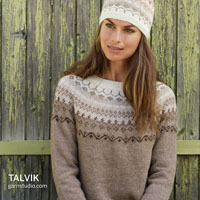 For at Melody skal gi en mohair look vil alltid være litt løse overskuddsfiber som faller av ved brukt, dette vil avta etterhvert. Du kan også bruke en klesrulle for å fjerne løse fibrer før bruk.